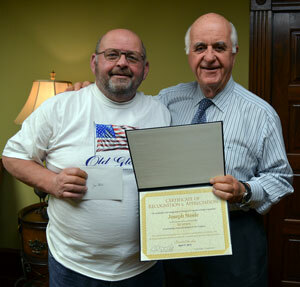 Joe Steel (Pultrusion Lead-Bristol) was recognized on April 17th, in honor of his retirement from Strongwell. Joe was with Strongwell for 20 years. He began his career as a Machine Operator, where he later advanced to become a Pultrusion Coordinator in 2000 and was promoted into Pultrusion Lead in 2006. His retirement plan consists of moving to Ocoee, Florida with his fiancée and taking advantage of over 200 acres of prime fishing real estate on Starke Lake. He is also looking forward to visiting the coastlines of the Atlantic Ocean and Gulf of Mexico. Joe plans to visit his family and friends in the Tri-Cities area frequently. Strongwell congratulates and thanks Joe for his hard work and dedication over the years.